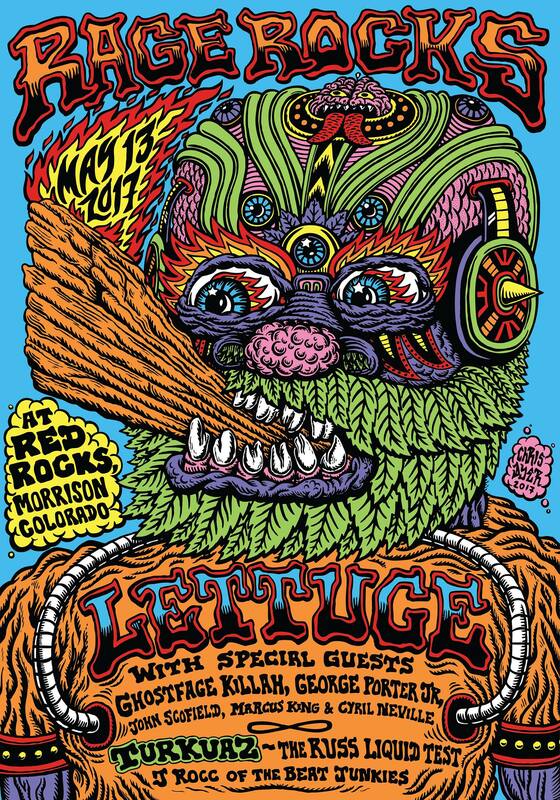 The Funk Fools themselves, Lettuce, are coming back to Colorado for their annual Red Rocks rendezvous, RAGE ROCKS on May 13th, 2017, and this time they are bringing ALL of the rage vibes with them. Wu-Tang’s Ghostface Killah, George Porter Jr. (who needs no introduction), John Scofield (who has played among the greats of Miles Davis, Joe Henderson, Herbie Hancock, Phil Lesh and many more), Marcus King (a twenty year old soul influenced psychedelic southern rock, Marcus King Band), Cyril Neville (a percussionist and vocalist from New Orlean’s The Meters and The Neville Brothers), Brooklyn’s nine member PowerFunk band Turkuaz, The Russ Liquid Test and J Rocc of The Beat Junkies. This is set to be a funk fest you will never forget. If you are a Lettuce head, a fan of funk music or just good music for that matter, get your tickets and LETTUCE RAGE ROCKS!